Raising a prodigal is every Christian parent's worst nightmare. Horrifyingly, George Barna contends that over 60 percent of Christian kids will run off to university and "lose their faith." Some pollsters believe the number is as high as 80 percent. But there is great news Your child doesn't have to become a statistic. Your child can become an adult who loves the Lord the same way you do but this will likely require a radical parenting reset on your part. Todd Friel has witnessed to hundreds of university students, most of whom are Bible-belt backsliders. Reset for Parents gets to the heart of the issue and presents a solid, biblical roadmap for parents to avoid the pain and heartache of raising a prodigal. 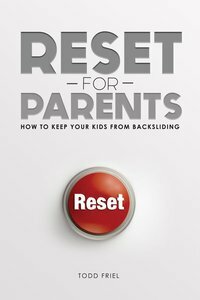 About "Reset For Parents: How to Keep Your Kid From Backsliding"
Todd Friel studied to be a pastor for four years but neglected to actually get saved. He abandoned church ministry plans and did secular TV, radio and stand-up comedy for 6 years. Gratefully, God saved Todd (from hell and stand-up comedy). Since then, Todd has combined his pastoral training and media skills to host Wretched Radio and TV. Todd has one wife, three children and a dog.